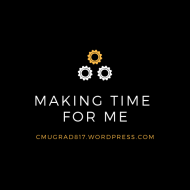 Flashback Friday…the Original Making Time For Me Post! Posted byMaking Time For Me December 15, 2017 December 15, 2017 Posted in#Blog, 2017 Themes, Flashback Friday, MakingTimeForMeTags: #3yearsblogging, #Blog, #blogger, #flashbackfriday, #fromthebeginning, #howitallbegan, #justuseoilandwater, #MakingTimeForMe, #reblogLeave a comment on Flashback Friday…the Original Making Time For Me Post! FBF: #40Notes40Days: Someone Who Walked with you Through the Valley of the Shadow of Death! Posted byMaking Time For Me March 24, 2017 Posted in#Blog, 2017 Themes, Flashback Friday, MakingTimeForMeTags: #coparenting, #flashbackfriday, #loveofmylife, #luckyinlove, #marriage, #myoneandonly, #valleyofshadowofdeathLeave a comment on FBF: #40Notes40Days: Someone Who Walked with you Through the Valley of the Shadow of Death! FBF: Do you have a Vision Board? Posted byMaking Time For Me February 17, 2017 Posted in2017 Themes, Flashback Friday, MakingTimeForMe, Ways of ThinkingTags: #believeit, #flashbackfriday, #health, #home, #lawofattraction, #thesecret, #visionLeave a comment on FBF: Do you have a Vision Board? FBF: #40Notes40Days: Someone in need of healing! Posted byMaking Time For Me February 3, 2017 February 3, 2017 Posted in2017 Themes, Flashback Friday, MakingTimeForMeTags: #40notesin40days, #cancersucks, #flashbackfriday, #healing, #hope, #prayers, #projecttransplant, #todayistheday, #todayisyourday, #yougotthis, loveLeave a comment on FBF: #40Notes40Days: Someone in need of healing!